There are no doubts, that any other study on diversity patterns in birds will support one of patterns mentioned in McCain’s study (more or less significantly depending on sampling effort). Anyway, another interesting question arises from current knowledge. The relationship between species richness and combined temperature and water availability may be due to both direct (thermoregulatory constraints) and indirect (food resources) factors. Considering that food is one of the factors, we could assume that different feeding guilds could have different diversity patterns along gradient. According to Terborgh (1977, Andes, Peru), the trends are strikingly different. Syntopy (sharing the same habitat within the same geographical range) among insectivores undergoes the greatest change with elevation (more than 5-fold). 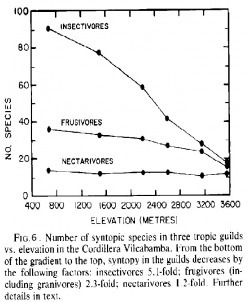 Frugivore declines less sharply, (2.3-fold) while syntopy in nectarivores is entirely independent of the gradient. Another probable cause for the decline in insectivores could be a scarcity of insect at high elevations. Several major groups including ants and termites appear to drop out altogether above 2.500 m. Reduced syntopy among insectivores at high elevations can thus be explained as the response both to simplified vegetation and to reduced food resource base. Above mentioned explanations are intuitive and well supported, therefore it seems to be interesting that Kessler et al. (2001) did not find similar patterns when interested in species diversity in Bolivian Andes (Figure).Their findings seem to be in disagreement with those of Terborgh. Kessler et al. (2001) explain that in can be consequence of the much wider gradient of habitat types and complexity in their study. However, the very close correlation between species richness of insectivorous, frugi-granivorous and all bird species is noteworthy, and may also reflect incomplete sampling.